If you asked me what is the earliest memory I have about a film, my answer would be Tron. I apparently drove my parents crazy wanting to rent and watch it constantly. So it was a given that I went to see Tron: Legacy on opening night. Another given is that Jeff Bridges is the man. His character progression for Kevin Flynn from the slacker/techie video gamer from the original to the techie slacker pretending to be Obi-Wan in Legacy felt natural. Bridges’ portrayal of the antagonist CLU was cold, precise, driven, and focused on his goals. Though, CLU, like his creator Kevin, found joy in the games. Garrett Hedlund’s Sam Flynn is an adrenaline junkie who inherited his father’s techie slacker tendencies. He was an effective protagonist. And his scene reuniting with his father was very well done; it was touching; it felt real. Olivia Wilde’s Quorra was a really fun character. She was tough, but full of awe and curious about everything. She’s an optimistic A.I., whose random and awkward bursts of laughter can be described as adorable. Daft Punk? They were a perfect fit for Tron: Legacy. And any fan of both Daft Punk and Tron knew this right off the bat. Their score for the film was brilliant and really did “alter the mood” accordingly. Director Joe Kosinski had a recent interview with Discover Magazine, which you can read HERE. 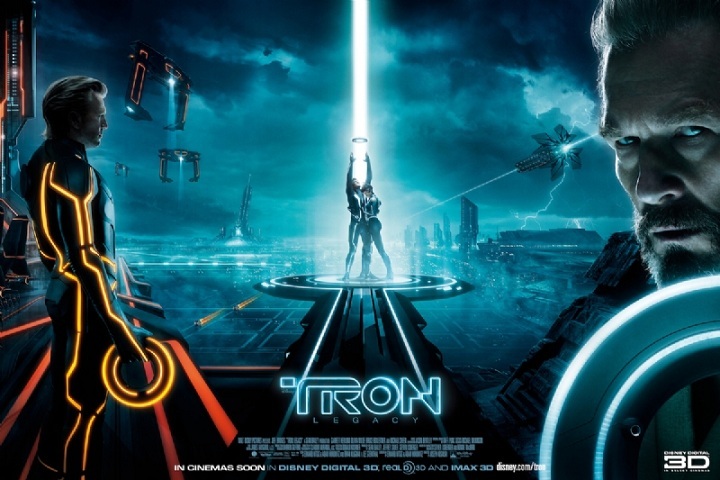 Tron: Legacy lives up to its predecessor, and it’s an entirely fun movie. Watch it. You know you want to.